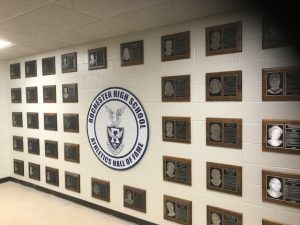 The Hall of Fame is located in across from the Main Entrance at the Main Gym in RHS. Members will be inducted based on their contributions to the athletic program, college or professional sports, or their special contributions to society. A special induction ceremony will be held at a varsity football game every fall for the elected members of the Hall. Anyone can nominate potential members within the rules set forth in the by-laws. Forms can be picked up in the athletic office, or downloaded below and must be returned to the athletic office before March 31st of each year. For more information, please Contact Dean Allen, Athletic Director at (248) 726-5414.